There are few entertaining economists, and fewer still work on Wall Street. 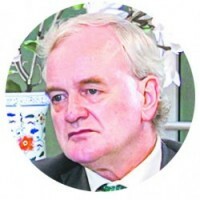 Willem Buiter, the chief economist of Citigroup, is one of them. He is not only entertaining, but also outspoken—and his analysis of key economic trends and themes is second to none. The Epoch Times spoke with Buiter about Federal Reserve (Fed) interest rate policy and the surprising strength of the euro, as well as the impossibility of a Chinese soft landing. The Epoch Times: What is the Fed up to? Willem Buiter: Well, there is very little tightening. The Fed has been raising its policy rates, unlike most of the central banks, who’ve been keeping them constant or are still cutting. But in real terms, policy rates are no higher now than they were before—maybe slightly less expansionary than they were, but there’s very little restraint. You have the anticipation of balance sheet shrinking being announced probably in September. But that itself is not a major issue for markets in the most liquid assets in the universe. Long-term rates are low, the stock market is booming, the currency is relatively weak, and policy rates are edging up in nominal terms very, very slowly. We’ll see one more rate hike, probably at the end of the year. So that is technically tightening relative to a situation we didn’t have, but there is very little absolute monetary tightness. Financial conditions and monetary policy continue to be very supportive of economic activity in the United States. Most of the commentators have never seen a rate increase before. The last time the Fed started hiking was nine years ago, so any rate hike looks dramatic, when in fact it is very little on top of almost nothing. Any rate hike looks dramatic when in fact it is very little on top of almost nothing. The Epoch Times: Why is the dollar so weak? Mr. Buiter: I think financial conditions at the moment for the United States are probably too easy. They encourage financial froth and speculative behavior. So taking some of this excess liquidity out of the system is beneficial for financial stability. With respect to the dollar, I think it is mainly a euro and Canadian and Australian dollar strength story. The Canadians have been more restrictive with policy than anticipated. Their decision to raise rates 0.25 percent and probably more in the not-so-distant future was unexpected. In the euro area, we see growth this year—likely again around 2 percent—of the kind that you haven’t seen for years and years and years. 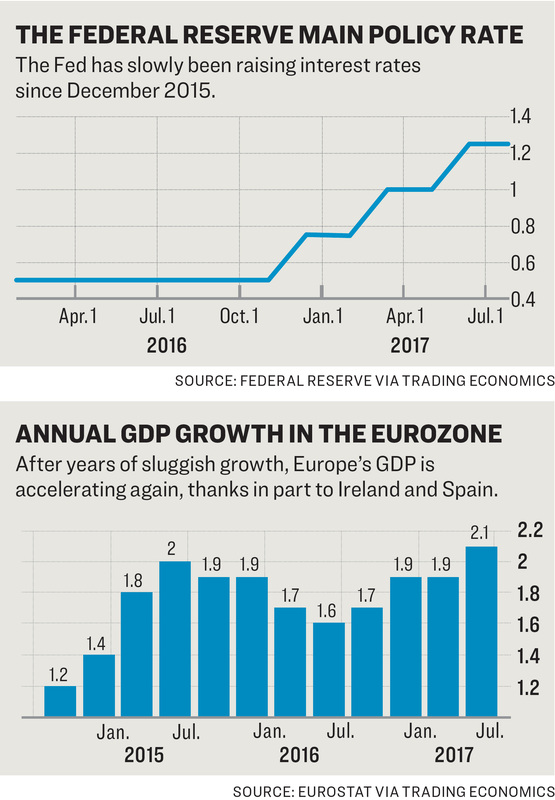 In fact, last year the eurozone outgrew the United States, and it’s not inconceivable it will do so again this year. And the European Central Bank (ECB) hasn’t done anything except verbal tightening. It’s clearly hinting at the fact that there are circumstances in which it would actually end the balance sheet expansion and even conceivably circumstances where it would raise rates, although we don’t expect that until the middle of 2019. The unexpectedly rapid growth in the eurozone especially is undoubtedly pro-euro. Remember the political news on the eurozone has reversed and has all been positive. The Netherlands didn’t go populist, France didn’t, and Germany’s recent elections showed continuity. So there is a market sense that maybe populism in Europe has peaked. I think it’s premature, but it looks like its inexorable advance has been halted and slowed down. The eurozone has been a net positive surprise; I think Europe has done surprisingly well in terms of their economic performance. The Epoch Times: Who are Europe’s best performers and why? 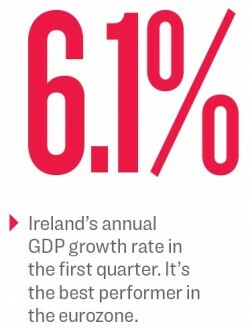 Mr. Buiter: Ireland and Spain are the fastest growing. The growth of 2 percent for the euro area as a whole depends on the big beast, Germany. In Ireland, it was simply undoing the damage caused by the largest banking bubble and real estate bubble that probably Europe has ever seen. And all they had to do was to clean up the financial mess. They did so, and now they’re growing again. The Spaniards had a much more difficult challenge because they didn’t just have a massive banking and real estate bubble, very much like Ireland. They had a supply-side problem: labor markets, regulation, tax system. It was horrendous, and they needed serious supply-side reforms, including limited privatization, deregulation, and labor market reform. There’s always more that you’d like to see, but they’ve done more in terms of structural reform than any European country since the Great Financial Crisis, and they’re reaping the rewards. The Irish partly took the financial sector balance sheet on the public sector balance sheet. That was a mistake, but they did it, and they restructured. They still have the Irish taxpayer footing the bill. But given the fact that it had to be sorted out, they moved early and fast. And the rest of Europe is still trying to sort out their balance sheets. Look at Italy, Germany, and Austria—these countries still have major under-resolved banking issues. According to some estimates, there is a trillion euros’ worth of nonperforming loans on the eurozone banks’ balance sheets—and this is nine years after the Great Financial Crisis. So this is asking for Japanification, and there’s some evidence there’s actually going to be a response now. The ECB is pushing for a response, and the European Commission is pushing for addressing the nonperforming loan issue in the eurozone as well. Denial is a popular river, but it’s not the river that you want to drink from. You have to face the pain early. The Epoch Times: There is another country that has a big debt problem but so far refuses to solve it. Mr. Buiter: China, against my expectations, actually upped its growth in the first half of this year, and most estimates, our own included, implied a slowdown in the second half. The growth rate for this year is probably 6.8 percent, which is way above what I think is the sustainable growth rate for China. Excessive leverage is still rising fast in the corporate sector and local governments, and now also for households. 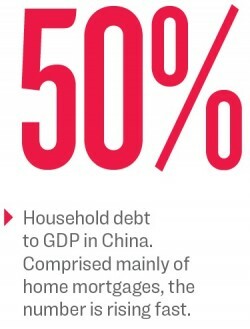 Household debt is headed for 50 percent of GDP. One should not just look at the level of household leverage in China—because it is still not high—but on how fast it rises. The speed at which it rises tells you something about the quality of the credit that has been issued. And then there is excess capacity. It’s been addressed in steel, in coal, and to a certain extent maybe in aluminum. In most other sectors, massive excess capacity is being addressed by adding to it. So it’s unsustainable. It will end. When? They will keep the show on the road almost certainly until after the 19th Party Congress this fall. And then I assume that the authorities, if sufficient consolidation of political power has taken place by then, will move to restructure the bad assets and probably again create asset management companies—bad banks to deal with this overhang of bad assets accumulated since 2008. They will—and should—be able to tell local and regional governments to address excess capacity in their important industries and have these orders actually followed and not ignored. Like in the old style, you know, “the mountains are tall and the emperor is far away”—that was very much true in China over these past four or five years, when the center wanted to get the regions to address excess capacity or excessive leverage. But I expect this will be different. Now, assume they do this, they address leverage and excess capacity. Can they do it without creating at least a cyclical hard landing? Possibly yes, but it’s never been done. The Epoch Times: So the Chinese should just do what the Irish did? Mr. Buiter: Yes, they of course have a small problem that the Irish don’t have: Whatever they do has global repercussions and feeds back to them through trade balance, commodity prices, and even through the admittedly slightly obstructed capital account. So it’s easier to be radical when you’re small. To be big and radical is hard. But yes, it is still the only way to minimize the amount of avoidable pain.